Brown County Forge is a full-service blacksmith shop. When weekend classes aren’t in session, we’re making home hardware for folks around the world. Door handles for a tiny mobile bakery. Personalized bottle openers and hooks for Etsy. 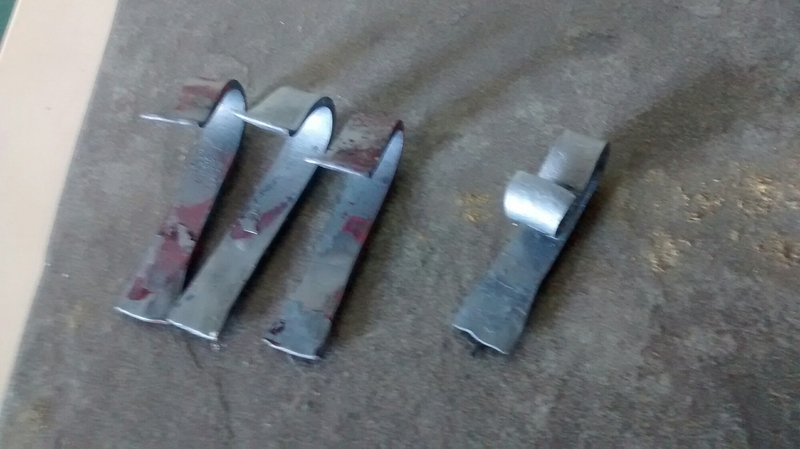 Oar hooks for a customer in Pennsylvania. To make each item, Terran heats up pieces of steel that have been cut to specific lengths. When they’re glowing hot and yellow-orange in color, he starts to bend and shape them with his hammer and anvil. Depending on the piece, it might take a few heats to make a piece. 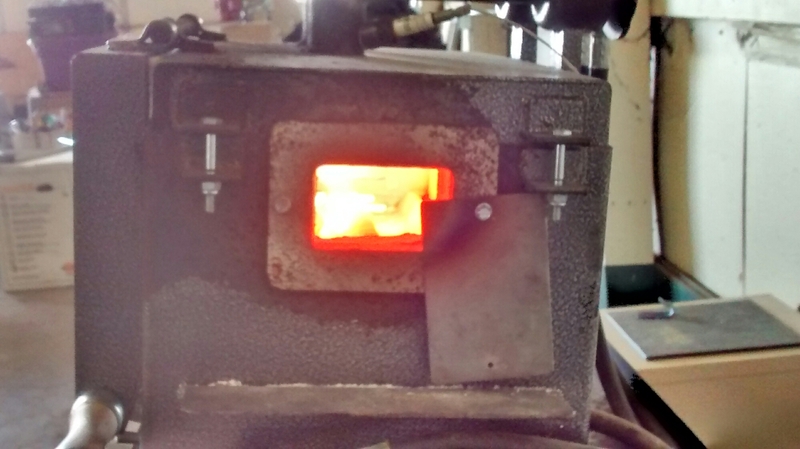 A typical hook like you see in the photo above can take as few as 4 heats from start to finish. One heat to flare the ends. 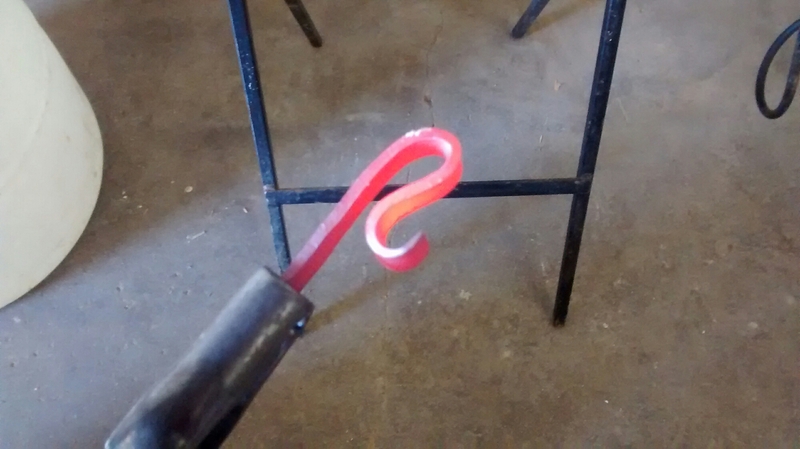 A second heat to bend the decorative hook tip. The third heat to quench that tip and make the bend of the hook. And the final fourth heat to undo the quenching and loosen any scale so it can be brushed off. Terran likes to keep things simple. To his artistic eye, simple rustic curves and bends are the most beautiful. A long-time perfectionist, Terran used blacksmithing to train himself to “let things go.” Blacksmithing is good therapy! The rest of the week at Brown County Forge will be spent cleaning and organizing to get ready for the next set of projects and classes. Want to see more pictures and videos? Take a look a the Brown County Forge Facebook page for hundreds of photos and videos. I hope your holidays were good and 2016 has gotten off to a roaring start. It sure has at the Forge. Classes start tomorrow evening and they’re quickly filling up for the rest of the month. I’m excited about sharing this set of skills with people interested in blacksmithing. That brings us to the title of this Shop Update and New Year’s Resolutions. I’m not much for limiting resolutions to the first of the year. You end up getting super-motivated for the rest of January, maybe a little into February, and then you peter out. It’s been more effective for me to make changes as I go along. When inspiration to change something hits, that’s when I resolve to do it differently. With that said, this is still the time of year many people are very focused on setting goals. So here’s the one goal I’ll put forward for the year: create something with your hands. You might find some metal, throw some coal in an old grill, get it hot, and bend it into something beautiful. Here at Brown County Forge we’re pretty specific about how we help people create. We take one of the hardest materials on the planet, apply heat and energy, and turn it into something beautiful and useful. To make this easier, the Forge is sponsoring a Hammer and Tongs Giveaway with DIY Blacksmithing. From now (11 AM January 7) until 11:59 PM January 10, folks from around the U.S. are putting their names in a virtual hat to win a Peddinghaus Blacksmith’s Hammer and a set of Wolf Jaw Tongs. Enjoy January and start making things! Merry Christmas and Happy New Year from Brown County Forge! The blacksmith shop will be closing up for the next couple of weeks to celebrate the holiday season. If you leave a message, we’ll get back to you after the holidays. Terran and everyone at the forge hope to see you in the new year! 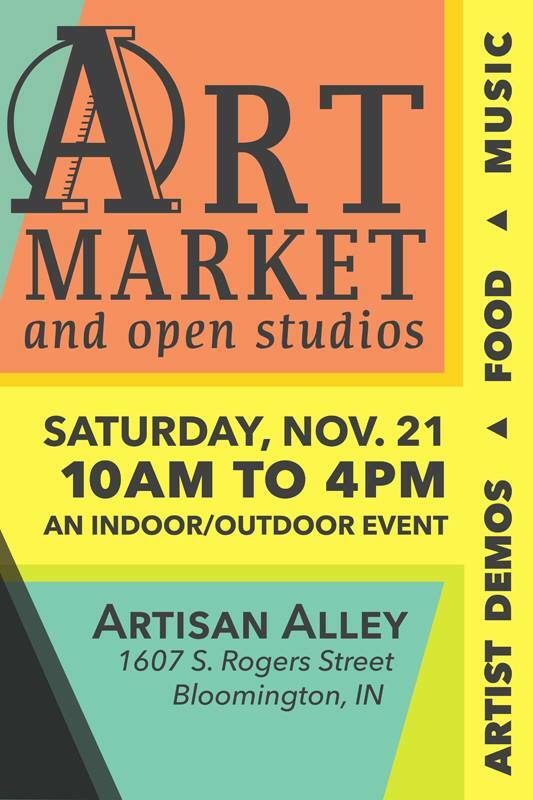 Demonstrations at Artisan Alley Tomorrow! Come out and see Terran demonstrate blacksmithing techniques at the Artisan Alley Art Market. He’ll be hand-forging hooks, doing some beeswax finishing, and providing some excellent Christmas gifts. There are still some January class times available. Check out the Calendar and give an experience this Christmas! To get to Artisan Alley: Point Google Maps to 1607 S. Rogers St in Bloomington and Brown County Forge will be at the end of it. We’ll see you there! Today was the second full day in the winter shop and the first day of forging. It felt great to heat up the forge and start experimenting with some metal. It had been a while since I made one of my Unbreakable Bottle Openers so I spent a good part of the day getting my chops back. There were a few corrections (undoing bends, redoing bends), but that’s part of what’s great about metal. If it comes out weird, just reheat it and make it better! By the end of the day, I had a nice collection of decorative wall hooks and bottle openers ready to be drilled out for wall mounting and keyrings. I also recorded some video of each process from start to finish. Look for the videos within the next week or so.